Q1. 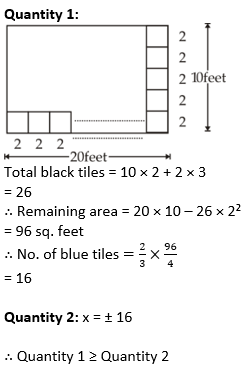 12.002 × 15.005 – 8.895 × 6.965 = ? Q2. 105.1% of 8401.01 – 3/7% of 5600.12 + 9.999 = ? Q7. 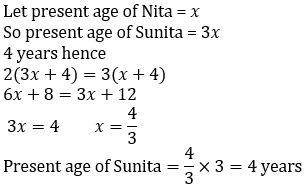 Present age of Sunita is 3 times the present age of Nita. 4 years hence twice the age of Sunita will be equal to thrice the age of Nita. Find the present age of Sunita. Q8. 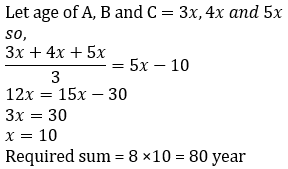 Average age of A, B and C is 10 year less than age of C. If ratio of age of A, B and C is 3 : 4 : 5 then what is the sum of age of A & C.
Q9. 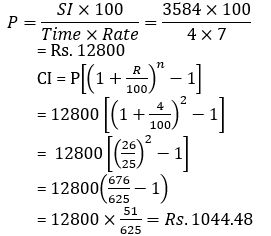 Simple interest on a certain sum at 7 p.c.p.a for 4 years is Rs. 3584. 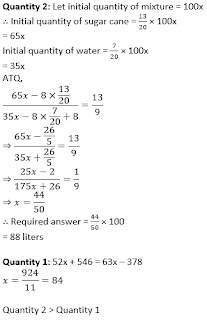 What will be the compound interest on the same principal at 4 p.c.p.a. in two years? Q10. There is some profit when an article is sold for Rs. 720. However when the same article is sold for Rs. 420, there is some loss. If the quantum of loss is two times the quantum of profit, find the cost price of the article. Q11. 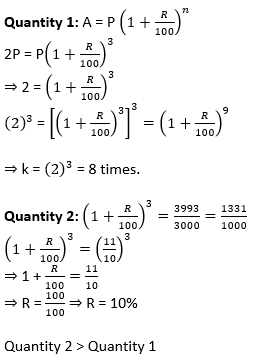 Quantity 1: Simple interest on the same sum for same 4 years at the same rate of interest. The simple interest on a certain sum at a certain rate of interest for two years is Rs. 3200 and compound interest on the same sum at the same rate of interest for two years is Rs. 3520. 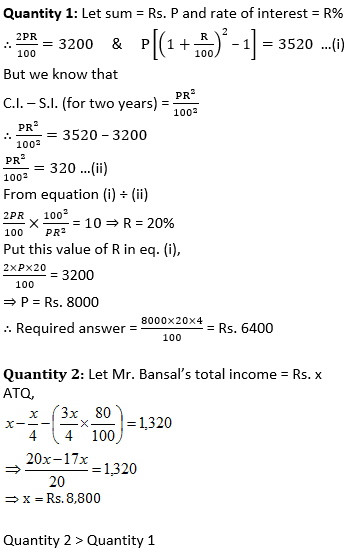 Quantity 2: Total income of Mr. Bansal. 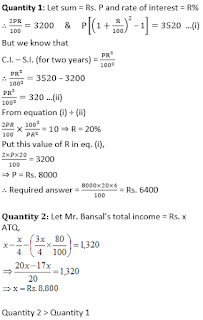 Out of his total income, Mr. Bansal spends 25% on house rent and 80% of the rest on house hold expenses. he saves Rs 1,320. Q12. 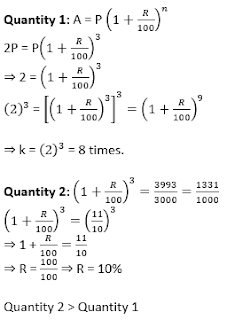 Quantity 1: Value of k. A sum at R% compound interest doubles in 3 years. In 9 years it will be k times of the original principal. 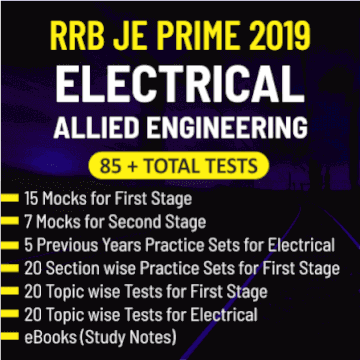 Quantity 2: Rate percent per annum at which Rs. 3000 amounts to Rs. 3993 in 3 years, if the interest in compounded annually? Q13. 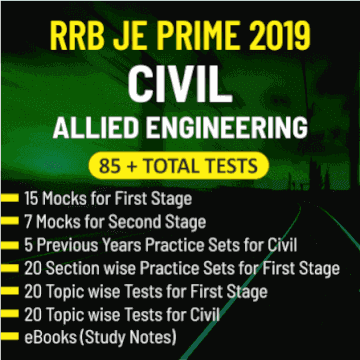 Quantity 1: Time taken by B to cover the same distance as that by C. A is twice as fast as B and B is thrice as fast as C. C covers the same journey in 54 minutes. 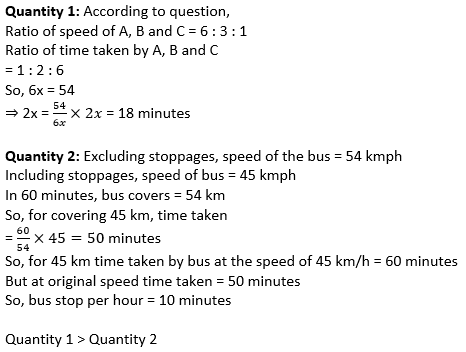 Quantity 2: Time for which bus is stopped per hour. 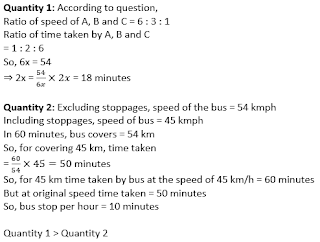 Excluding stoppages, the speed of a bus is 54 kmph and including stoppages, it is 45 kmph. Q14. 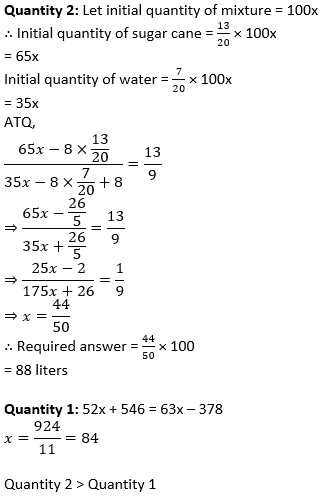 Quantity 2: Initial quantity of mixture in the bucket. There is a certain quantity of a mixture of sugar cane and water in a bucket. Due to a leak in the bottom of bucket 8 litre of mixture were gone out. At the same time leak was observed, leak was closed and filled with same quantity of water. The original ratio of sugar cane to water and new ratio of sugar cane to water is 13: 7 and 13: 9 respectively. Q15. Quantity 1: No. of blue tiles. The length and breadth of the floor of a room are 20 feet and 10 feet respectively. Square tiles of 2 feet length of three different colors are to be laid to the floor. Black tiles are laid in the first row on all sides. If white titles are laid in the one-third of the remaining and blue tiles in the rest, how many blue tiles will be there?